For over 100 years this truth has been demonstrated to this congregation—Our God is faithful to His people. God has had a people in this place for over a century now, and Burkemont Baptist has been a God-inspired venture from the start. In 1910 at a business meeting held at Mull's Grove Church, the proposition to look for property on the Old Rutherford Road (now Burkemont Road) and to move the church to a location where people could have easier access was made. By 1915 property was secured from Molton and Ida Brittian, and by 1916, the first church building--a white frame structure built by the men of the church--was completed. 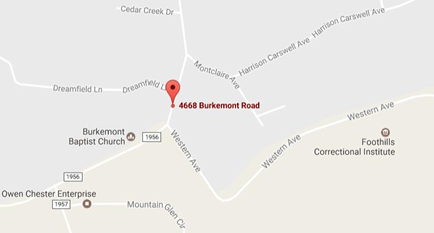 On January 16, 1916, a presbytery met to organize this new church called Burkemont Baptist. Letters were presented by those seeking to move their membership and the Articles of Faith and Church Covenant were read and adopted that day. The early congregation was comprised of thirty charter members who were led by the first pastor, Rev. J. P. Hagaman (1916-1917). Other pastors of Burkemont Baptist from 1916-1949: Rev. M. T. Harris (1918-1916), Rev. W. H. Walker (1920-1921), Rev. F. A. Bower (1921-1924 and 1943-1944), Rev. W. B. Sprinkle (1924-1925), Rev. M. G. Cloer (1926-1927), Rev. J. E. Hill (1927-1928), Rev. H. S. Benfield (19-29-1932), Rev. L. E. Snipes (1933-1936 and 1944-1950), Rev. W. H. Flowers (1936-1939), Rev. R. R. Cooke (1939-1941), Rev. P. T. Brock (1942-1943). Growth in these years further.proved the faithfulness of God to this congregation. Membership increased six-fold, Sunday School programs taught the Bible to all ages, a bus ministry was introduced in 1945, music for worship was emphasized, and numerous protracted meetings (revivals) resulted in converts to Christ. Classrooms were added to each side of the white frame sanctuary to make room for these people and programs. The early founders of our church prayed, gave, worked together, and worshipped God faithfully, believing that He would always be with them and with this church that he set upon this hill. By the late 1940's, the congregation began to save for and build the second building that would house Burkemont Baptist Church. Under the leadership of Rev. Luther Snipes the church, a new brick sanctuary with educational facilities were constructed. The first service in the new sanctuary was held on August 28, 1949. In 1950, God led the church to employ its first full-time pastor after Rev. Snipes resigned his position. Rev. Johnny Tiller served from 1951 to 1970. During these decades, the membership and salvations multiplied. Educational facilities were added in 1954 and then again in 1965. January 1966, the church celebrated 50 years of the Lord's Favor with a Golden Anniversary celebration in the new fellowship hall. Following Rev. Tiller's tenure, three other full time pastors have served at Burkemont Baptist. Rev. Robert Tenery 1971-1990, Rev. Mark Pridgen 1991-2004, and Rev. David Mills 2005-2017. Beginning in 1972, the pastoral staff was increased to include full-time associate pastors. Eighteen men have filled these roles in these five decades. Associate Pastors: Ronnie Owens 1972-74, Larry Armentrout 1975-78, Larry Arnold 1978, David Russell 1979-87, David Byers 1987-89, David Orders 1984-86, Steve Davis 1989-90, Clyde Murray 1992-2003, Preston Stainback 1996-2003, Bill Holland 1996-2008, Philip Long 2005-13, Brain Skeggs 2006-13, Dustin Scott 2009-14, Scott Harmon 2014-15 and Support Pastor Harold Sprinkle 2003-2010. Current Associate Pastors are Eddy Bunton, BBC’s longest tenured pastor, began in 1997; Kevin Uhrich in 2013 ; and Josh Sizemore in 2014. Building facilities have been added to match the growth of the church. The current sanctuary was built in 1975, followed by the addition of the Family Life Center and educational wing in 1988. Expansions and renovations in the last three decades kept pace with the needs of the programs of the church. God has been faithful to provide the resources for these expansions to the extent that in this the 101st year of the church, Burkemont operates debt-free from building loans. In 2016, the congregation celebrated a century of God’s faithfulness to Burkemont Baptist with a year-long emphasis and special events such homecoming, evenings of memories and shared testimony of years past, and a special conference where men called from the Burkemont family to full-time service for the Lord preached the services. A pictorial history book of the church was compiled and published as well. A copy is available for checkout in the church library. First and foremost, the mission of this church and congregation has been to know Christ and to make Him known to the community and around the world through the teaching of God’s Word, evangelist outreach in our community, and support of missions both local and worldwide.